Someone could help me in modding my solar sailer plese? I don't know from where to start ! edited by Chief: Link removed. these images were used without permission from Nannan at Brothers Brick. Here's a suggestion, read the image guidelines before posting again. Anyway , Why you have to be so sullen with me? I bought the set, but haven't put it together yet. I'm going to work on fashioning a sail probably this weekend. I'll see if I come up with anything neat. I'm sure everyone can put their heads togehter. Finally someone that think in the correct way! If I go ahead with my project ,I'll let you know... I've alredy a few Ideas! Since this set is only available in Europe so far, may I suggest maybe that you try a little patience and wait until more members here are able to put their hands on the set. Once the sets is available everywhere and more people get it, I'm sure there are lots of creative folks here that will be able to come up with different modifications that will inspire you. This set is available in the US already. I got one at Toysrus last week.So its here. But the odd appearance here or there doesn't constitute a full release. Once its available on S@H, its released. Pretty much every TRU in So Cal has had one on the shelf, I have seen quite a few. Lego Store Glendale will have them out on the shelf starting Feb 1 I'm told. Since this set is NOT WIDELY AVAILABLE SO FAR, may I suggest maybe that you try a little patience and wait until more members here are able to put their hands on the set? 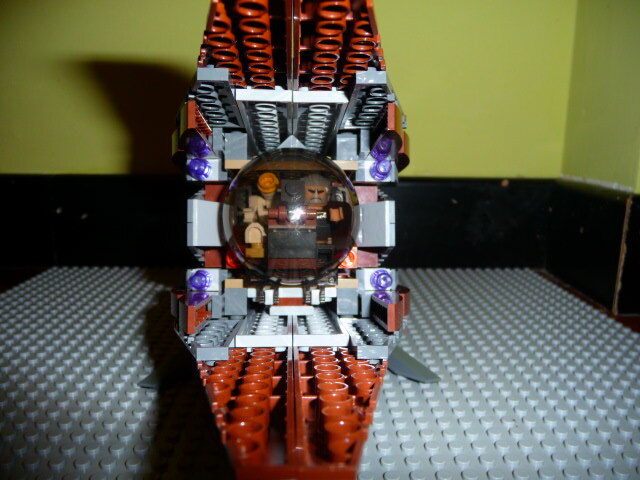 Anyway Now the cockpit can fit also count Dooku and the interior are totally changed! The rear part of the interior is now divided in two rooms the first can fit until 6 minifig (or 4 with a table in the center) ;the second room, that is formed by the two grey pieces, can fit 2 or 3 minifig an there is also a sort of stair as a boarding ramp! The interiors of the rear can be easily changed (by taking apart the floor) to fit the speederbike! Now I'm working on the sail, I'll make them by fabric so that are easy to close. When I'll finish all the mods I'll upload my sailer on MOC. Very cool....that's what I was planning to do as well with that front bubble. Please post more pics with different angles!!!! Hi, Isn't it against policy if his link shows and leads to leaked pictures of the new sets? Just curious. Nope these aren't considered leaked, the set is already popping up in stores and is on S@H.
Once a set has been found in a shop, I believe any pictures of the set from that box is OK to post. Needless to say - that set is available in the ROW, so posting images isn't against the brick. sorry, please let me clarify what I meant. If you click on the link and scroll down, you will see a set not released yet. And on that site, you will see all the sets not yet released. yea I get what you mean. Ask the mods about this and see what they say. If that was any other mocpage, I'd consider this an unfortunate loophole. However, I'm sick of seeing this page that uses stolen images from Brothers Brick without permission. So I have a legit reason to remove said link. Done! The rear part of the interior is now divided in two rooms the first can fit until 6 minifig (or 4 with a table in the center) ;the second room, that is formed by the two grey pieces, can fit 2 or 3 minifig an there is also a sort of stair as a boarding ramp! if thats the case then any link on the FBTB forum to either Brickshelf, flikr, Moc pages etc is against the RTB policy since leaked pictures can be found on any of those sites. it's getting a bit rediculous! First of all, it's spelled "ridiculous". Even I, a French Canadian, know that. Second, go read the CoC and the Respect the Brick policy, and try using your judgement. AdmiralGrievous was walking a fine line here, and stealing images from Brothers Brick just placed him on the wrong side. Taking his defence against the staff is not the way to go here, unless you trully don't want to be here. Instead, learn from that situation to become a better member. Like I said, we've got a funny loophole here. His links go *directly* to his mocpages, where you can see images and links to the 2009 images. If we couldn't see those on his page, no one would have noticed and we'd have no problem. There's a couple other members here with flickr and brickshelf accounts with leaked images in them, but *I can't see those images* when I click on the links they provide. It's reasons like this why there's discussions about this specific version of the RTB policy being abandoned as we move forward. Then we need a new version on the RTB and we need to make it no links to sites that have any leaked material! Wether it be Flickr,MOCpages,Briskself ect. Why do you think I am siding with Ry? You know that's a ridiculous idea, so I'm not sure what you're trying to prove by saying it. You're not paying attention to what I'm specifically pointing out here: There's a couple other members here with flickr and brickshelf accounts with leaked images in them, but *I can't see those images* when I click on the links they provide. It requires another round of clicking or searching to find them. This hasn't been a problem until now. I'm so tied and bored of you guys! 1-do not call me a loophole person ! because the 2009 sets photos on my moc are not directly linked on fbtb (so this respect the RTB) ... it was not my intention doing this ! 2-I'm very tired that every time I post something ,all of you want to find something that do not respect this policy...I don't know! ... If you want I let you cone in Italy , In my house to search if I'm hiding some 2009 sets photos (so that you can say that I do not respect the RTB)!This would simplify your job! 3-it seems that in this forum is all about the RTB Policy ! Because every time you start a new topic, it will end in this argument! For all this things I'm starting to dislike this forum ! Be realistic; you don't do anything else that is not discussing about the RTB ! These aren't the pictures we're looking for. Move along, Move along. AdmiralGrievous, the majority of the users on this forum don't generally have a problem with the policies we enforce, I don't know why we're having such a hard time with you. The rules are (mostly) spelled out here, which you're *supposed* to read before you join: don't get mad at us when we enforce them and "you didn't know." Please note that we've left the main subject of your posts intact; your moc images. I also feel like there's a language barrier here and some of the finer points aren't coming through in translation. I'm sorry for this, and hope we can work our way through it without hurt feelings. In closing, if you don't like it here, leave. We can't -and therefore won't- stop you. We love our audience and members, but if we lost sleep over every single one we offended or drove away from the site, we'd have all died from exhaustion long ago. And then you'd have zombie staff.